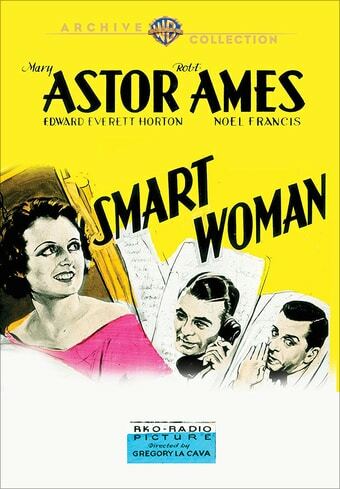 This week I watched Smart Women (1931) and Ladies of the Jury (1932) a pair of pre-codes now available on DVD from Warner Archive. In one of the sharp young woman roles she frequented after her her silent cameo girl days, Mary Astor plays devoted wife Nancy Gibson, who learns her husband Donald (Robert Ames) is stepping out on her. Devastated, she decides to use indirect means to win back her man. She invites his paramour Peggy to stay with them for the weekend (Noel Francis, who was always good for stealing a man if Claire Dodd wasn't around), with her equally devious mother (Gladys Gale) in tow. Also on the guest list: Sir Guy Harrington, a much sought-after bachelor who pursued Nancy in vain on a recent cruise. Guy knows Nancy only needs him to make her look desirable, but attends in the hope of changing her mind about him. It's hard to understand why Nancy wishes to win back her disloyal husband as Ames is neither attractive, witty or charismatic. Sadly this is partly due to the fact that the actor was nearly dead from alcoholism and could not hide the trauma of his personal struggles. However, it's hard to picture how even in better health this unappealing man could have believably won back his betrayed wife. After getting her blood going with a few sessions of vigorous exercise outside with Sir Guy, Peggy isn't so sure she wants Donald. It's clear that she's not the kind of woman to settle, but in this case, she doesn't seem off the mark. Though it has its moments, it doesn't add up to much more than blandly pleasant entertainment. Edward Everett Horton manages to slide in a few zingers in a supporting role as Donald's brother-in-law. The image is watchable, though a little rough around the edges. There are quite a few pops on the soundtrack. There are no special features on the disc. 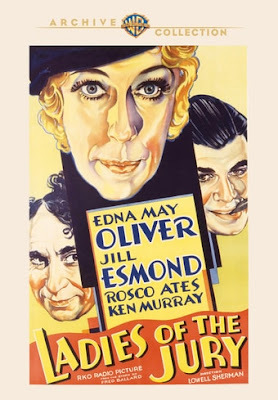 In a rare solo leading role (most of her headliners were as the detective Hildegarde Withers), the always reliable character actress Edna Mae Oliver is delightfully silly in this comedy that shows its stage play origins. In a madcap precursor to Twelve Angry Men, the actress is Mrs. Livingston Baldwin Crane, a wealthy juror who takes control of a murder trial when she is initially the sole member to believe in the innocence of a French former showgirl (Jill Esmond) who is accused of murdering her estranged husband. Taking place almost entirely in a courtroom and a jury deliberation room, the film relies heavily on fast-paced dialogue and constant jokes to grab audience interest. With her long face, snooty voice and broad mannerisms, I would think that for the most part a little Edna Mae goes a long way, but with plenty of quips, characters and twists to keep the action going, she never wears out her welcome here. She somehow manages to be both broad and subtle, playing big with her voice, but also sneaking in extra layers of meaning with a roll of the eyes or a dip of the chin. In addition to being able to speak fluent French with the defendant, she implies that she knows plenty about the sort of life that could lead to a predicament in which the lady on trial finds herself. In the sort of wealthy matron role that would generally involve a lot of pearl clutching, Crane plays against the type as a woman who enjoys the freedom and privilege her wealth gives her and is appreciative of the more playful, racy elements of life. She's also a straight shooter, whose morals prevent her from hiding behind that privilege. Those morals extend to saving innocent ladies, but not so much to following the law in order to achieve that goal. The heavily populated supporting cast ranges from wooden to humorous, no one threatening to outshine Oliver, but most of them providing good support, and occasionally a few laughs. By the end of the 64 minute running time, it feels time to move on, but this flick is good fun. Though it has lots of tiny dirt marks and scratches, the image is watchable and generally good. There are no special features on the disc.